In medieval times a trebuchet was used as a weapon. They were used to catapult stones at the enemy. Trebuchets come in different sizes. There is a modern T-Wrecks version that can catapult piano that weights over 500 pounds across 500 feet. Cut a long piece of wood into eight separate pieces. Three of them needs to measure same size. One needs to be the longest piece. The rest should be shorter than the last pair. Draw a line from the end point of a triangle to the other end of the triangle. Cut a square piece of wood on the diagonal. This will give you two same sized triangles. Attach a 3/4 longer piece of wood. Secure a triangle wooden piece to an attachment made before. The triangle’s position should be on the long side. Glue the triangle to the other side. Place the two pieces together from the three smaller pieces from before. Your setup should have the triangles positioned outside and two upright arms. Place the smallest piece at the base and upright arms. Use nails to nail the pieces in order to reinforce the glue on the pieces. Mark the right positions on the upright arms. They should be marked an inch from the top. Place your axle at this place. Use a cylindrical shaped section of metal as the axle. This should be the same length between the base and the upright arms. Drill holes into the upright arms. 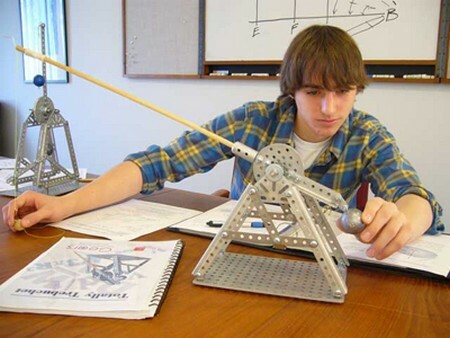 Build the arm of the trebuchet that will swing by making holes (three) along the piece of wood that is longest. The first of the series of holes should be 1/4 of the complete length from the edge. The other holes should measure 1-2 inches apart from where the first hole is set. Make the holes with a Drill. Put the axles in one of the holes and swing the wood in a circles. Attach a hoop hook close to the drilled holes. Your counterweight goes here. Place a hole in the opposite side. Cut the head off and bed it. On the swinging arm place another hoop hook there. Your projectile should go here. The axle should be postitioned through the arm of the base of the trebuchet. Swing the arm to test it. Collect some small stone and place them in plastic. Tie the plastic closed. It should weigh close to a golf ball. Tie the weight to the hoop hook. Make two 20 inch long strings of yarn. Twist some metal wire into a loop. Put the look on the end of the yard. Tie the free end to the hoop hook on the other side of the swing arm. Put the metal hoop over the nail. Put section of plywood or cardboard onto the side of the base of the trebuchet. Lower the arm that seings to meet the sling. Stretch the sling. Load it and release.